Many thanks for all the lovely messages after so many of my samples got pinched at the weekend. I've had stores, where I've previously demonstrated, offering to return samples that I left for them as well as people asking if they can help me to make new ones. All very much appreciated and it does emphasise the fact that the good people really are still very much the majority, even though it doesn't always seem like it. I'm back on track now, more or less (! ), working through my check list of things to get done. I'm waiting for a parcel to arrive which is stopping me from getting on with one project...it's floating around somewhere in the UK but, at the moment, nobody can tell me where! Trying to actually speak to a real person at Royal Mail is, apparently, asking too much and the local sorting office just refuse to answer their phone. Oh well, just have to play the waiting game and hope it arrives soon before my deadline runs out. 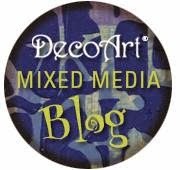 ........one package contained bottles of Deco Art So Soft fabric paints as well as the strip of little pots of the paints. Below those are Metallic Distress Paints and the new colours of Dylusions ink sprays that came in parcel number two. The eagle eyed of you may spot that one of the Metallic paints is actually "plain" ol Vintage Photo - I put the wrong bottle there when I lined them up to snap them!). The new Dylusions colours are very lovely indeed and I've been (im)patiently waiting for them for a while now! I spritzed them onto white card just to quickly show the colours. As one is white, I sprayed that over a couple of the colours to show the effect - it kept morphing into different patterns and shades as I watched. Of course, my photo won't do justice to the true colours but they are, clockwise from the top....Funky Fuchsia, After Midnight, Cherry Pie, Dirty Martini and Calypso Teal. You can see the effect of the White Linen over areas of the Midnight & Cherry colours. These are definitely going to be used today on some tag backgrounds! I'll be using them at both Brigg garden centre, near Scunthorpe, on the 25th May and at my demos at the Craft Barn Extravaganza over 31st May-2nd June. Meanwhile, I'd highly recommend getting your mitts on them! Oh, I forgot to say that the So Soft paints are for painting two more sweatshirts with my Doo Lally Pip designs. I've washed the pink sweatshirt that you've seen on here (or at my demos) and am very pleased to report that the designs looks exactly the same. I was going to hand wash it but decided to give it a real road test and it went into the washing machine with some other items (including furry slippers, so they would have given it a bit of a pounding!) on a quick wash. I did wash it inside out as a slight precaution, but I'm really impressed with the paints - no cracking, no flaking, no fading! Brilliant stuff! I did start my orange sweatshirt today but after I'd painted the "Doo Lally Pip" words I realised that I hadn't pre washed the garment - what a twit! So, I'm letting it dry for 48 hours then I'll wash it and repaint the words if the design has come off. I suspect it may well still wash okay, but I'm not going to risk painting the entire design. I'll let you see the results in a few days of course! What horrible people, to have taken your samples!